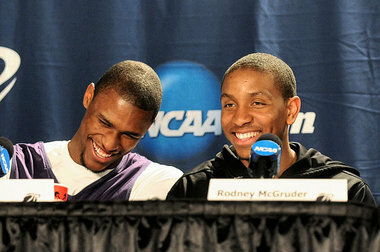 Off the court, Rodney McGruder is a great personality, and people migrate to him. On the court, he is all business. According to coach Frank Martin, the more serious mentality is exactly what young Kansas State needs. The unwavering intensity during practices as well as games is something the Wildcats lost from last season. Martin goes back to the guys whose work ethic he holds as a benchmark: Jacob Pullen, Denis Clemente, Luis Colon and Chris Merriewether. “Clemente would throw a ball off your face in a heartbeat if you were joking around in practice,” Martin said. 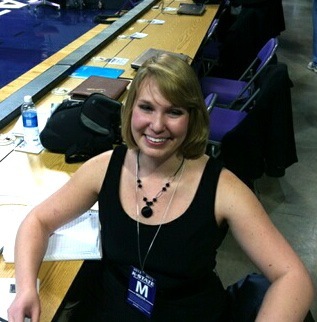 “Chris Merriewether would pick you up and slam you if you were joking around in practice. Now off the court, those guys were awesome. They were awesome. If Luis Colon saw me get mad in practice because somebody took a shortcut, I felt bad for somebody in practice. I’m just telling you. I’m being honest with you. His teammates have noticed. In practice, if you do not match his intensity, you will end up getting burned and looking bad. Before taking on Kansas in Bramlage, the Wildcats grinned like kids as they laughed and danced in the tunnel before emerging for warmups prior to the Big Monday matchup. Shane Southwell and Angel Rodriguez joined in the pre-game tradition that was usually dominated by Martavious Irving and Jordan Henriquez. McGruder, on the other hand, came onto the court without a smile. He played 38 minutes in the game and finished with 12 points and 8 rebounds. It was not his best performance by any stretch, but it spoke again of the consistency and work ethic he brings to the floor. Pullen, Clemente, Colon and Merriewether demonstrated the single-minded focus during their time at Kansas State, and then-young McGruder paid attention. Now, the point guard has come to exemplify that same approach this season. This year, he has indeed become one of the team’s leaders, but recently that new role took a backseat because of a painful infected callous on the guard’s toe. It kept him out of practice for two weeks, forcing him to devote most of his attention to his own performance. Martin understands this shift and expects that as McGruder gets back in tune with his own game, he will put increasing emphasis on holding his teammates accountable for their performances as well. On Thursday, the coach seemed optimistic that the time would come soon. The Wildcats’ second Big 12 road game of the season went nearly as badly as its first one. Facing an Oklahoma team led by former Kansas State coach Lon Kruger, the No. 18 Wildcats fell 82-73 in Norman and dropped to 1-3 in conference play this season. The Sooners shot 55 percent from the floor – including 70 percent in the second half – and led the Wildcats the entire game. Oklahoma burst out of the gate with a 7-0 run before Kansas State got on the board with an old-fashioned three-point play from Thomas Gipson. An 11-2 flurry by the Sooners gave them a 10-point advantage, 18-8, before the Wildcats – and reserve sharpshooter Jeremy Jones, particularly – put together a 10-2 run of their own to get within two points, 18-20. From that point on, though, Kansas State could not get stops on defense. They did not score consecutive baskets for the rest of the half, and the Sooners led 38-29 at halftime. Throughout the first 20 minutes, Kansas State shot 33 percent from the floor, while Oklahoma shot 45 percent. Maybe most gruesomely, the Wildcats were on pace to have as many turnovers as they did last game – 20. They would end up with 19. The Wildcats received major contributions off the bench from Jeremy Jones and Nino Williams, who each added 12 points. Williams also corralled 9 rebounds, which played a major role in setting up Kansas State to get 25 second chance points in the game. After the break, the Wildcats muddled along in much the same manner as they did in the second half. With 8:27 to go, they went on a 10-0 run to cut Oklahoma’s 18-point lead to 8, but between turning the ball over and rotating late on defense, they could never get within less than seven points in the second half. While Kansas State battled throughout the game, the combination of its mistakes and the Sooners’ spot-on shooting made it a rough afternoon for the Wildcats. In a preseason poll of Big 12 coaches, the Wildcats were picked to finish 6th out of 10 teams in the conference. Even though Kansas State is 1-2 in conference play, surely those coaches – and others – are now ditching their original doubts about the 2011-2012 Kansas State team. Everyone questioned the caliber of the team going into this season because of the absence of Jacob Pullen. What would the team be like in the first year without him since Frank Martin became head coach? To compound that worry, the Wildcats opened Big 12 play against three top 25 teams: No. 15 Kansas at Allen Fieldhouse, No. 6 Missouri in Bramlage, and No. 4 Baylor in Bramlage. But lo and behold, Kansas State ran right over previously undefeated Missouri, and even in losses to Kansas and Baylor, the Wildcats made it clear they were not going away easily. At Kansas – well, let’s stop there. Hardly anyone other than the Jayhawks wins in Allen Fieldhouse, so let the record show that it is a difficult place to play. Regardless, the Wildcats could have won that game. Behind 35-20 at halftime, they had clawed within three points in the second half. If they had not allowed Kansas to get so far ahead early, who knows what would have happened? Also, the Jayhawks outrebounded the Wildcats 50-26. That is inexcusable. I am no statistician, but I do not think you will ever find a game in which a team got destroyed on the boards like that and came away with a win. Here’s the thing, though: Jamar Samuels, Jordan Henriquez and Thomas Gipson are strong, talented players. They can handle Kansas down low. They did not do so in that game, but to count the Wildcats out on Feb. 13 – the Big Monday rematch in Bramlage – would be silly. Heading into the next game, against undefeated Missouri, not many outside the team seemed optimistic. In Dallas, about to head home from the Cotton Bowl, a fellow Kansas State fan in the elevator said to me, “This might be a rough weekend.” Then, of course, the Wildcats proceeded to completely blow out the Tigers in Manhattan. Six players scored seven or more points; four were in double digits. Kansas State blocked more shots, grabbed more rebounds, had more assists and absolutely shot the cover off the ball – as Martin might say. They got the lead early and stayed on the throttle well enough to get the win by a large margin. Sure, it might have been an off-night for Missouri, but that win was a huge confidence boost for Kansas State and a big step to showing that the Wildcats can contend for the Big 12 championship, regardless of what happened in the first game of the conference season. Versus Baylor, the Wildcats just lost control. They went up by double-digits halfway through the first half, but their 20 turnovers simply killed them. The Bears went on 18-4 runs in both the first and second halves. That happened because the guys wearing K-State jerseys threw the ball to the guys wearing Baylor jerseys so they could go down and dunk it – that was how Martin explained it to me after the game. He was in disbelief that the team could not a defend its lead at the end of the game to close out a win at home. The positive takeaway from this game was an incredible performance by Rodney McGruder. He scored a career-high 30 points. While it was not enough, it gave an indication of what he can be to this team. Also, the Wildcats were this close to knocking off the No. 4 team in the country. They could have done it. The fact they didn’t – at least from where I sit – does not mean that they can’t in the future. It just means they have a little more growing up to do.